The countdown is on until Virginia basketball’s 6:09 p.m. ET tip with Auburn in the first game of the 2019 Final Four. 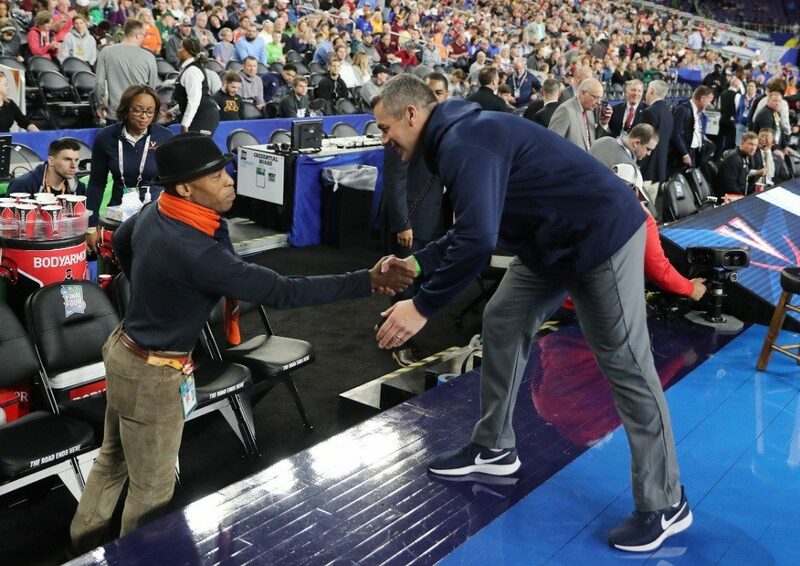 Who among UVA royalty are on hand in Minneapolis to support the Hoos in their first Final Four since 1984? Jimmy Miller, who was a player on the last Cavalier team to make a Final Four, enters U.S. Bank Stadium as Virginia men’s basketball’s color analyst. The legendary Ralph Sampson, who led the Cavaliers to the 1983 Final Four, with famed Virginia athletics stats man Danny Neckel. Former UVA coach Terry Holland, who coached both previous Final Four teams, is on hand. 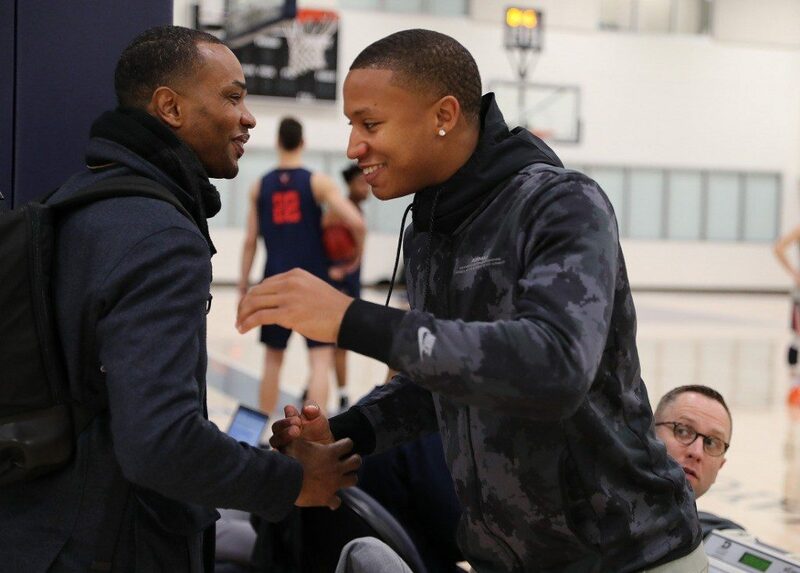 Former UVA player Devon Hall, who helped the Hoos to the 2016 Elite Eight, is pictured here with former Cavalier assistant Ron Sanchez at a Virginia practice in Minneapolis. Photo is courtesy of Matt Riley of VirginiaSports.com. UVA Director of Athletics Carla Williams is in Minneapolis supporting the Cavaliers. Legendary Cavalier football player Tiki Barber shakes hands with head coach Tony Bennett. Photo is courtesy of Matt Riley of VirginiaSports.com. In addition to Devon Hall, former UVA players also confirmed to be in town are Justin Anderson of the Atlanta Hawks, Justice Bartley, Cade Lemcke, Pete McLaughlin, Norman Nolan, and Evan Nolte. Nolan took to social media to express his excitement. Last but not least, former Virginia men’s soccer head coach Bruce Arena. Enjoyed reconnecting with former #UVa soccer coach Bruce Arena this morning at Cavaliers’ #FinalFour hotel. Hasn’t changed a lick since his Virginia days. Wish I aged as well.